Love,love, love Private Collection. I must've smelled it a million times as a child (in Montreal in the 60s/70s, I guess EL was the only alternative to expensive French perfume. In fact, it's the only "familiar from childhood" perfume I can wear without feeling like an impostor. That galbanum-hyacinth note is what I live for, as my applications of my precious vintage Vent Vert (another beast entirely: VV is a galbanum monster) are few and far between. Any other suggestions for a galbanum top-loaded scent? Bel Respiro could be it, but it's such a wimp on me: 10 seconds of bliss, then pffff. carmencanada: if you love galbanum, try Li Altarelli by Stephanie St. Aignan. Available at LuckyScent. It starts with a crisp light note then delivers a nice dollop of galbanum. It's not Private Collection, but then again, nothing else is. I only recently read about this and it sounded like PC would immediately enter my pantheon of HG scents - I was making positive "check" sounds all down the line w/ the notes. But...no! :-( Sob! It goes to pure soap on my skin. What is *wrong* w/ my chemistry?! I am going to order a sample from TPC and see if maybe the mini I got from ebay was somehow "off" - hope springs eternal. I really like this;I stop by EL counters periodically and ask to smell it. Now, I am usually given PCTG first, and have to explain. I haven't been moved to buy it yet, but perhaps someday. . .
Oddly, this AM I decided to dab from the vial of Tuberose Gardenia that's been awaiting sampling since winter. I'm not sure it's me but certainly it's well done & beautiful. If I were a floral kind of gal beyond the occasional light jasmine (& I may yet be, but maybe not this year) this is one I'd want. carmencanada--Silences by Jacomo is a must-try for any galbanum fan. Thanks for the lovely review of ELPC--I will try it next time I'm having a retail experience. my fave Estee Lauder is Spellbound parfum in the dead of winter! cheers! How about Chanel No 19? Murasaki, Amazone, Chamade, Givenchy III, even Miss Dior? And, of course, as Sara said, Silences. I am so glad to hear somebody likes Aignan(s) too. I am so fond of that line. I can see how it would go to soap. It does on me too, on a very bad day. But not as much as White Linen is capable of being soapy. I am 99% positive I have a new version, and it came from the freshest source possible at that :-) I adore it. Maybe because I don't remember the old one. From what I know of your tastes, just reading your comments...I can't quite imagine you loving PCTG :-) I can see you wearing Tubereuse Criminelle though. Lovely to see you! I adore Silences too. TC is also too floral for me. I really think simple light jasmine for a hot hot day is my limit for floral tolerance. have you tried Malone's Jasmin and Mint scent? But the drydown , on me, isn't rich and full-bodied as I remember it. I love green chypre, and I was completely taken aback by the power and elegance of PC. It is really a stunning fragrance. I also love the new PC Tuberose Gardenia. I am sorry! You were talking about Vent Vert, right? And I was still banging on about PC :-)VV is not too fond of me either. I am wearing this today! The first time I tried it, all I got was pine, and I think the tester had gone bad, because the decant I got from Nancy F.'s sale is all I had hoped for. This is one of those scents that makes me a better person than I normally am. Existentialist, what a great way to put it! I adore Private Collection. I started wearing it when I was in my late teens, early 20s because my aunt wore it. It was much too old for me, but I adored it completely. You were just sophisticated beyond your years. I never thought I'd wear this either. The new Tub Gar by El is much too harsh and overpowering. 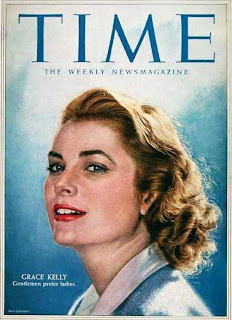 Here's to nostalgia, Estee Lauder -a genius , Grace Kelly and You! Hi again Marina, I , Madelyn E wrote the last comment ! Thanks for all the suggestions! The re-edition of Givenchy III seems to me to be a bit thin, and that green note is just too Vitabath for me. Chamade goes to soap. But I definitely need to give a try to the Stéphanie de Saint Aignan, the Cartier and the Jacomo -- I keep reading about Silences but I've never sampled it. And maybe N°19 will finally reveal its true beauty to me! I need to try Must in extrait, perhaps it will change my opinion of it. Please let us know if you find some more galbanum-full scents! I just tried this for the first time recently -- how could I have missed it? What an extraordinary fragrance -- it has the most arresting, improbable contrasts in it -- at least to my nose. I feel an FB coming on. Your reviews, by the way, are perfectly beautiful. My mom has this perfume, gotta love it. It's quite strong fragrance, but yet lovely and timeless.